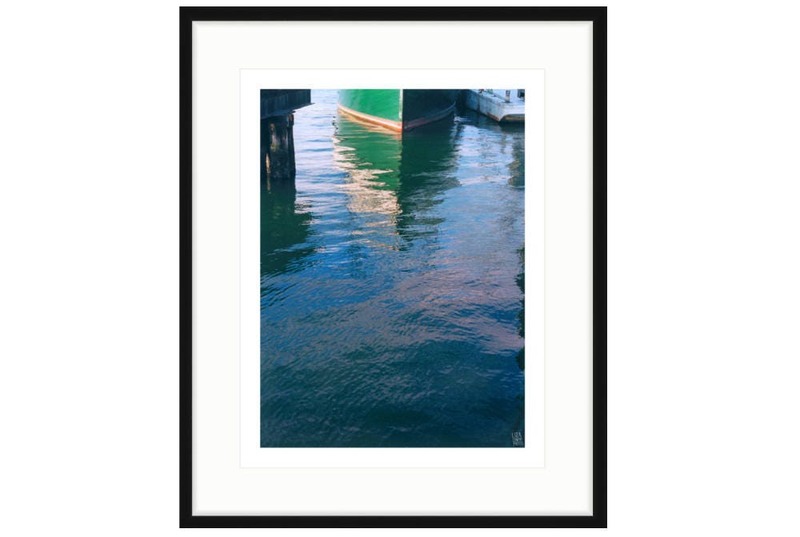 Abstract photo of the bow of a small ship in the water of the Greenport NY harbor. 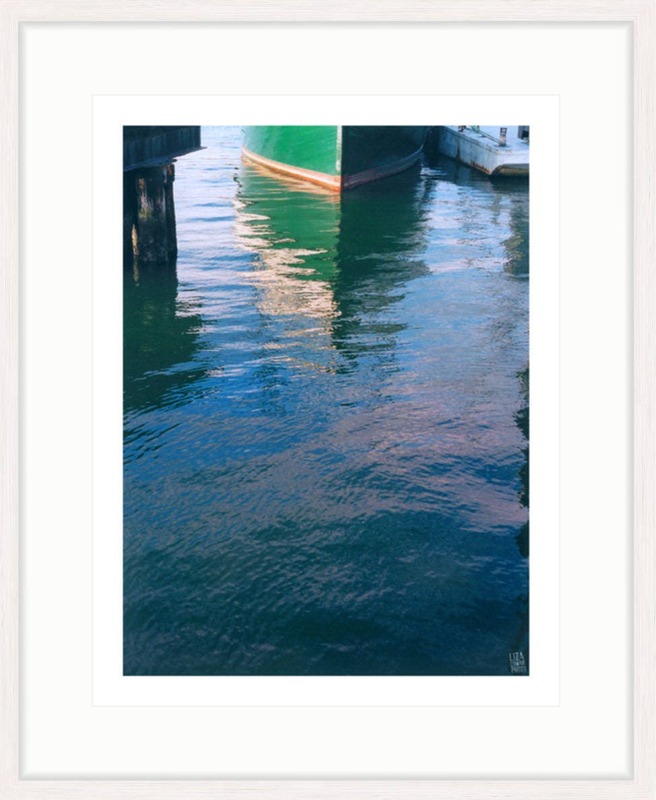 *** Available framed in two sizes and two frame options. *** size equals the dimensions of the framed piece. *** The art is printed using an Epson large-format impact printer with archival inks on Epson Premium Lustre or Enhanced Matte paper. Frame mouldings are premium wood, the acrylic is cut using the newest technology, and every single piece is assembled and inspected here in the U.S.
*** I offer two frame options and two size options. Check the photos to see what the frames look like. 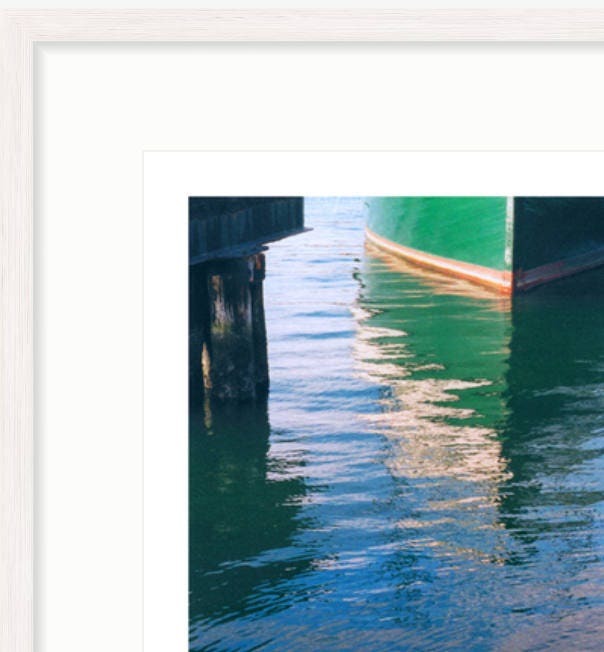 The frames are not made with glass, but with fine acrylic, making them lighter, easier to hang, less likely to break, and gorgeous! 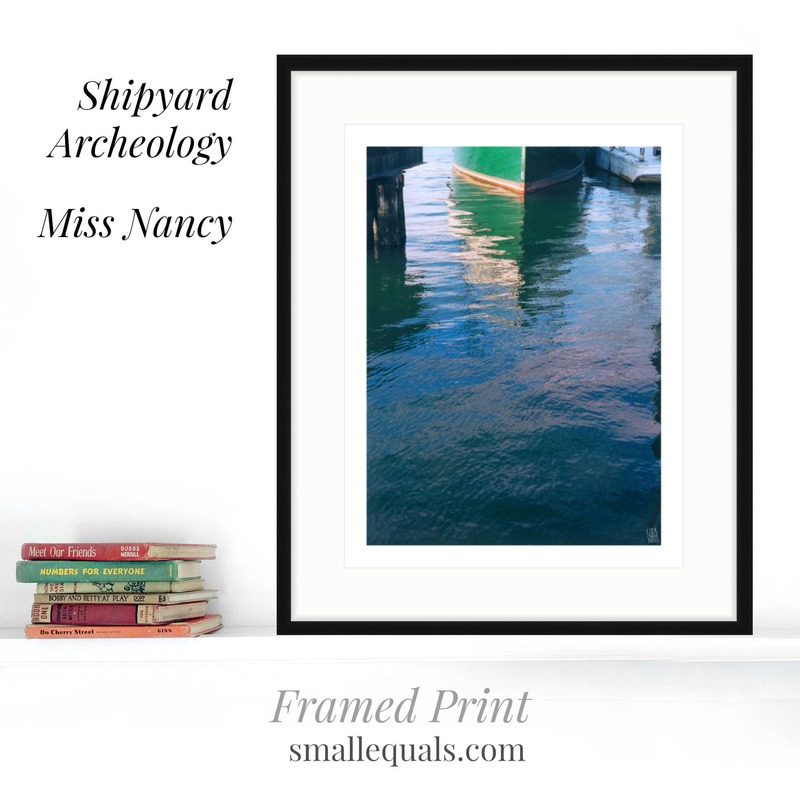 *** These framed prints are made to order, and may take up to three weeks to deliver, depending on the season and what holidays are coming up. I took these photographs from June 1999 to July, 2001, in Greenport, a small town on the end of the north fork of Long Island, NY. Greenport is an old whaling port as well as the site of a shipping industry that waned after its large role in W.W.II. The Greenport Yacht and Shipbuilding Company sits on the bay, tucked away just behind the vibrant and modestly upscale center of this tourist town. The beauty of the shipyard is complex and fascinating. The details I focus on show the effects of time and weather on the human made objects and the landscape that surrounds them. The industrial objects I was shooting were becoming more beautiful as they were exposed to the elements. As the usefulness of each thing leaked out, as the object evolved, or devolved from its state of creation, it became more of an artifact , more purely form. This process is exaggerated by the abstract vision of my pictures. The objects tell stories. Beyond the biological story of rust, corrosion, and oxidation, is the human story. Industrial practices change. What we need and how we buy and sell has an impact on the life of a town. Prohibition is over and there are no more rum runners. We no longer need whale oil. Gasoline tankers mercifully do not stop on the peconic bay. Nor do war ships. Many things made of wood, steel and glass that were once state of the art are now outstripped by microchips and polymers. Nevertheless, fishingpeople still haul their catches in wooden boats, the little ferries still chug across the bay, tankers haul their cargo. Ships that are showing the signs of age come in for a rehab and the process reverses. Old layers of paint are stripped off, corrosions are blasted and smoothed, metals are burnished. New paint goes on, new cogs and wheels are attached. Boats roll down back to the sea.